That’s Luke Scott and Carlos Peña of the Tampa Bay Rays. Love it. 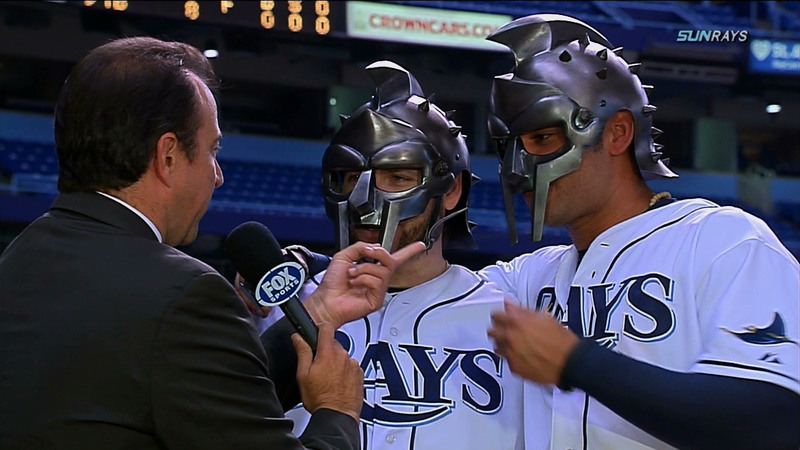 When Joe Madden was asked about his players rocking the Maximus masks, he said, “We were just trying to protect ourselves from further injury. And if anybody invaded the dugout we were in very good shape, also.” Awesome. This entry was posted in Baseball, Movies and tagged baseball masks, gladiator, luke scott gladiator, Rays, tampa bay rays gladiators. Bookmark the permalink.